Can species quickly evolve when humans rapidly change their habitats? The answer, in some cases, is yes. A new study of North American songbirds finds that major changes in wing shape have occurred over the last 100 years in response to human-driven forest changes. The study, based on measurements of 851 specimens from 21 songbird species at the Cornell Museum of Vertebrates and the Canadian Museum of Nature in Ottawa, Canada, was published online Feb. 1 in the journal Ecology. Since 1900, the extent of mature coniferous forests in Québec has shrunk as a result of extensive clear-cutting. That has put some birds under greater pressure to travel further to find mates, food and habitat. 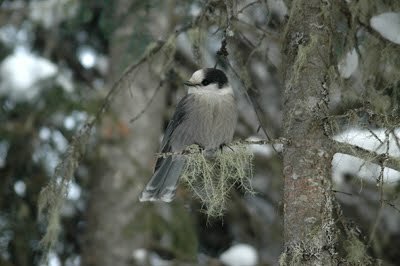 To fly the greater distances, such northern songbirds as boreal chickadees, gray jays and Cape May warblers have developed pointier wings. "It is better for birds to have pointy wings because it is more efficient for sustained flight," said the paper's author, André Desrochers, an animal ecologist at Université Laval in Québec City, Canada, who conducted the research while a visiting researcher at the Cornell Lab of Ornithology in 2009. On the other hand, since 1900 the forests of New England expanded after they had been heavily deforested in the late 1800s. That has prompted such songbirds as white-breasted nuthatches, hooded warblers and scarlet tanagers over the past 100 years to develop shorter, less pointy wings, presumably because the birds no longer needed to travel as far in search of suitable habitat. "If a bird is going to forage more in dense vegetation, they don't want cumbersome pointy wings," Desrochers added. Desrochers referred to a number of famous examples of how selective pressure has led to physical adaptations over short time scales: Beak length of Galapagos finches became shorter over a matter of a few years when an El Niño event changed precipitation patterns, which in turn, resulted in changes in food supply that favored finches with shorter beaks. And in England during the Industrial Revolution, soot made tree trunks dark -- which favored darker tree moths that could blend in and put white tree moths at a disadvantage. But recently, as pollution has abated and tree trunks have lightened, paler moths have reappeared. "We should not underestimate the ability of species to adapt" to changes to the environment by humans, said Desrochers, adding that conservation measures are still necessary. "Polar bears, for example, are not going to find some sort of breakthrough" as the Arctic ice floes that the bears rely on for traveling and hunting are melting, thereby threatening their survival, he added.